There are lots of folks out there who are interested in learning to play the classical guitar, but are not really too sure what to look for when picking out an instrument. For a newbie this is completely understandable as there are so many different choices available these days, many for some very alluring prices too. Today’s post is really aimed at the beginner or those looking for the market entry point student guitar. A guitar’s a guitar right? Not quite. At the entry level side of the market we see guitars with cheap, roughly made plywood tops, often painted or dyed a bright orange or yellow. They tend to look cheap and nasty and they tend to play cheap and nasty too – no better than the orange boxes they’re made from really. These guitars, whilst seriously, cheap could potentially put you off playing! They are often poorly built, roughly finished, difficult to play (which you may not realise if you’ve just started out) and sound terrible. Look out for a guitar with a solid top (the part of the guitar facing away from you when you’re holding it to play it), as this is the part of the instrument (aside from the strings) that most significantly influences the nature of the sound coming out. Solid top guitars will either be spruce (usually a lighter coloured wood, producing a bright sound) or cedar (usually a darker wood, producing a warmer sound than the spruce). 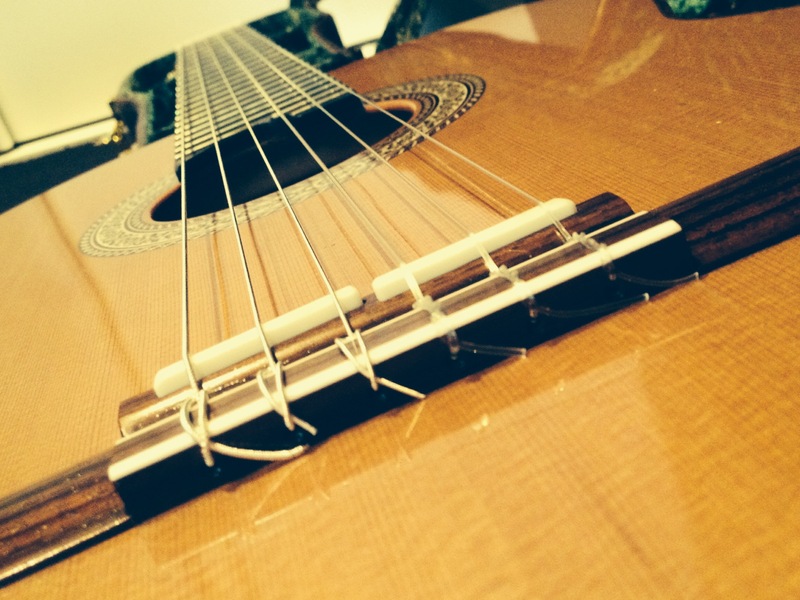 The “action” on a guitar is the height of the strings from the fretboard. Oftentimes the higher the action, the more difficult a guitar can be to play, particularly for the beginner as you’ve got to use more pressure to press the strings down. So check this out when you’re testing out an instrument (always test out if you can) and play the instrument for a while. You may be able to cope with a reasonably high action for 5 minutes or so, but you don’t want to feel like you’re running a marathon when playing your new instrument for 10 minutes or longer. Watch out, or rather listen out, for any buzzes, hums, rattles or any other unusual noises. Even at the cheaper end of the scale you shouldn’t really be getting any of these annoying noises that will be detracting from your playing and enjoyment of the instrument. Sometimes it may just be a case of a loose machine head, which can be easily tightened up, or the end of a string vibrating against the instrument (solved by just trimming the string down). If the source of a buzz or rattle is harder to find I’d say that’s a big warning sign not to buy. Not all guitars are made the same size – whilst all “standard” instruments are of a similar size there are subtle variations which can make a big difference over time whilst playing. Try out a few guitars and how they “feel” whilst you’re seated and playing them. How is the body depth? Do you feel you have to reach your arm a little too far? How is the width and the depth of the neck? Can you move your hand comfortably up and down then neck? Can you reach and play chords and barre chords with relative ease? If you’re smaller of stature, buying for a younger child or you have hands and fingers on the smaller size you may even want to check out a 3/4 size guitar or similar. So, which brand or make of guitar should I buy? Well, for a dirt cheap beginner’s instrument, for minimal investment of your cool hard cash (just in case you don’t like it after all), the Yamaha student guitars are not a bad bet. Don’t get me wrong – these guitars in the overall scheme of things are not the most beautiful sounding, but they are solid as a rock. For around AUD$140 they represent better value for money than other guitars at a similar price point. These entry-level student instruments have a solid top rather than plywood too. I would then recommend taking a look at the entry-level student range from Alhambra. The Alhmabra 1C is actually a pretty bloody good instrument for the cash (around $500) and you can take your pick between a cedar or a spruce top. The playability of these guitars is very nice indeed, the finish is of very high quality and they are capable of making a pretty decent sound. Definitely a better pick of instrument than any of the others I’ve tried at this price point. Most importantly of all – if you can try a few guitars out before you buy, I highly recommend doing so. Then you’re not just taking my word for it! Happy guitar hunting! Previous postThe LMusA Diploma Journey – Update #5 – 3 Months In & Keeping On Keeping On! Hi Nicole. Thanks for this – some useful advice. I was wondering if you had any advice on how to choose strings? Is it just a matter of buying a whole bunch of different brands and types and trying each one in turn? I would think it must be very hard to make direct comparisons given the time and effort it takes to switch from one set to another. I recently looked at classical guitar strings online and was totally overwhelmed not just by the number of brands, but also the number of choices offered by each brand – I counted over 150(!) different options on one site alone (www.stringsandbeyond.com/clasguitstri.html). What’s the difference between hard, normal and light tension, and why would you choose one over the others? What’s the difference between titanium, silver, bronze, copper, nylon, carbon, composite, etc? Why would I buy non-polished instead of polished? It all seems very complicated. What brand(s)/type(s) do you personally prefer? Perhaps a topic for a future post? Love the blog – it serves as a little piece of motivation/inspiration every time a new post turns up in my email inbox!!! If you have any more questions coming out of that, drop me a line again and I’d be happy to delve in further. Getting to your article very late but glad I found it. You mentioned that about $500-$600 will get you a good instrument. I was wondering where the next level of improvement can be found. Do you find that once you’ve hit that $5-600 mark there isn’t a major jump in quality until you go over $1K or do things just get incrementally better as you go up? I have been playing bass for a few years and found that, in general, once you hit about the $600-$700 mark there didn’t seem to be a substantial improvement (in terms of sound and build quality) until you jumped well over $I000 – some thought not until you hit the $1500-$200 point. Given that I will be buying my first classical I thought if I’m paying $500-$600 but there’s something significantly better for another $100-$200 then it would be worth it in the long run. The choices are dizzying enough so if anything that will help trim them substantially will be appreciated. Thanks for your question and thanks for reading the blog. I’ve been out of the loop of testing guitars at that very entry level of the market for a little while so can’t answer your question directly. I do know that there are some great quality instruments coming out of the Alhambra stable at the moment, some really good value for money so definitely worth checking them out. You don’t mention where you’re located, but if you happen to be in Australia and or the Melbourne area I highly recommend giving Pierre Herrero at Guitars online a call. He has some wonderful guitars in stock at all levels of the market and is happy to let you try as many as you wish. Thank you so much for the reply. Unfortunately I’m in Brisbane so won’t be able to get to Pierre’s showroom to try the guitars (I read your advice on making sure to try the instruments before purchase). The selection up here is very limited and most stores appear to only stock Katoh, Cordoba or Yamaha. However, if Alhambra and Camps are brands you would recommend (I see the latter on Pierre’s site) I’ll see if I can locate them before having to settle on another make.